Have You Thanked a Donor? Written by Maria Koppelberger. Media by Kristyn Chapman. The Offices of Advancement and Financial Aid hosted the Donor Thank You Project on Wednesday, October 30. As the name suggests, this event was held in order to thank donors who have contributed to Greenville College. The hosts provided delicious treats, apple cider, and even a Jo’s Java gift card drawing to encourage students to attend. All of the black and orange streamers and other Halloween decorations made for a very festive atmosphere. Since those colors just happen to be Greenville’s colors, the event was very school spirited, as well. Just a few minutes after the event began, President Filby dropped by the Upper Union to hang out with students and encourage us in our letter writing. As a senior, I have had several opportunities to participate in the Donor Thank You Project, but this was the first time I attended. I definitely regret not going before, because it was such a great experience. The Offices of Advancement and Financial Aid made it really easy for us to thank donors. Some students were given packets designed for them, so they could thank donors of particular scholarships or funds. Others were given a card to write to a donor who gives generally to the school, not to a specific scholarship. I had the privilege to write to Randy and Vondria Bergen, who have blessed Greenville College in so many ways. An impressive number of students showed up to write thank you cards, and it shows just how much we appreciate donors. Without financial aid of some sort, most of us would not be able to attend college, let alone a small, private, liberal arts college. Alumni and friends of Greenville are a key source of scholarship funds. Not only does it make sense to thank these donors, but it is also just the right thing to do. Since 96% of Greenville students receive some form of financial aid, chances are good that donors are supporting you in your time here at school. 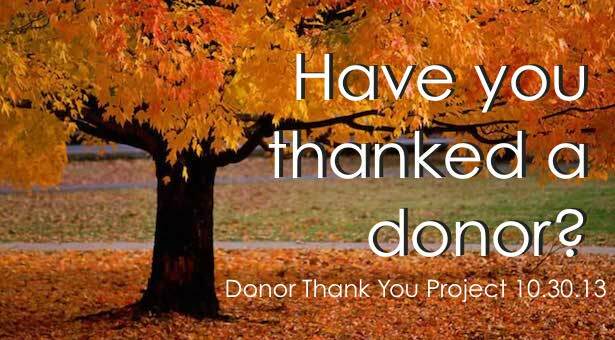 Have you thanked a donor lately? If not, go find an alumni or friend of the college, give them a big thank-you and tell them how much you appreciate them! Thinking so much about donors and alumni prompts me to wonder how I will contribute to Greenville after I graduate. I have had a great experience here, and it has changed me in countless ways. It is important to help other students experience the life-changing education that comes through attending Greenville College. Scholarships are vital, but money is not the only way to contribute to the school. Keep that in mind, and be creative when you think about giving back to Greenville after you graduate.